Another in the Wisden series, this invaluable tome records all of the 326 Tests played between England and Australia including the most recent series in Australia. Every Test is covered with its original Wisden report and very much more besides. Notes by the Editor, Cricketers of the Year and Obituaries are also covered under the relevant years and this anthology is a must as a treasure trove of information about cricket's most celebrated rivalry all in one book. The eminent statistician, Philip Bailey, has added a formidable statistics section at the end of the book including a resume of all series results and results by grounds, individual records and the index at the back may prove useful. The Foreword, written by the late Sir Alec Bedser, recounts his experiences of the Ashes and, modestly, his impressive record in five Ashes series and his much cherished friendship with team mates and Australian counterparts. The book is very clearly laid out in chronological order and consists of nine sections charting the history of the Ashes since the first Test in 1876-77. 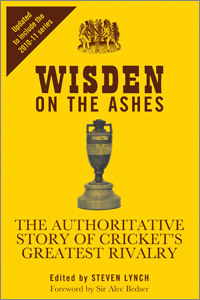 As we approach the 2000th Test this book may prove to be an invaluable asset to those of us wanting a full and detailed record of the Ashes who cannot obtain a full set of Wisdens. Scorecards are produced in full for the more memorable encounters and there is a resume of the scores at the end of each match report. There are both colour and black white photographs throughout the book. Being the definitive guide to cricket and the Ashes being the most celebrated cricket rivalry, this book should prove to be an extremely useful addition to any collector's library.